I think the convertible F-Type is a lovely car, but deep down I've always preferred the look of a coupe. Jag must have been reading my brain from that chip they implanted when I drove the roadster, because the new F-Type coupe is here. And it looks amazing. And while I'm understandably hurt and confused that Jag's design team didn't use any of my fantastic ideas, I'll grudgingly admit the coupe looks spectacular in person. The long, sloping roofline echoes the E-Type without slavishly aping it, and the proportions are, if anything, enhanced by the roofline. Interestingly, in some ways the car reminds me more of a Toyota 2000GT more than an E-Type, and that's not a bad thing at all. While I'm saddened that the side-opening hatch from the original E-Type wasn't retained, I do think the use of brightwork on the coupe is especially successful, most notably emphasizing the shape of the side windows. It's because of this tasteful and still dramatic detailing that I think the coupe works especially well in darker colors. If you have the gift of flight, spend a lot of your time leaning out of windows, or are a bird or perhaps a bat, then you're in for extra visual treats as the car looks great from above. The teardrop-taper of the roofline recalls an optimistic age of streamlined hopes, and the contrasting dark glass of the roof leading into the rear window keeps the car looking sleek and clean from above. ...which is, of course, some pretty overblown PR inanity, though if it was genuinely alive, nosing around the crowd, thinking, feeling, and wondering what this human emotion called "love" is, that would certainly disrupt more than just the automotive universe. There'd be theological issues as well, at least. The R variant is here at the party also, and while it has few visual cues to separate it from its littermates, it does have a nice R badge, so you can have TWO letters for your car's name. The R uses the same 5 liter V8 as the XFR-S, so we can likely expect about 550 HP from that kitty. The F-Type Coupe reveal was about as batshit as you'd expect for an LA reveal: a fake interruption of a presentation by Design Director Ian Callum that involved huge video screens distorting and going, improbably, to color bars before an unseen but very loud flyby of a helicopter with a searchlight, culminating in the back portion of this giant hangar we're all in (where the Spruce Goose was built, in case you're wondering) being illuminated with lasers. The lasers formed a long channel— sort of like what the old arcade game Tempest looked like — and down it blasted three F-Type Coupes. Overblown and a little silly? Sure. 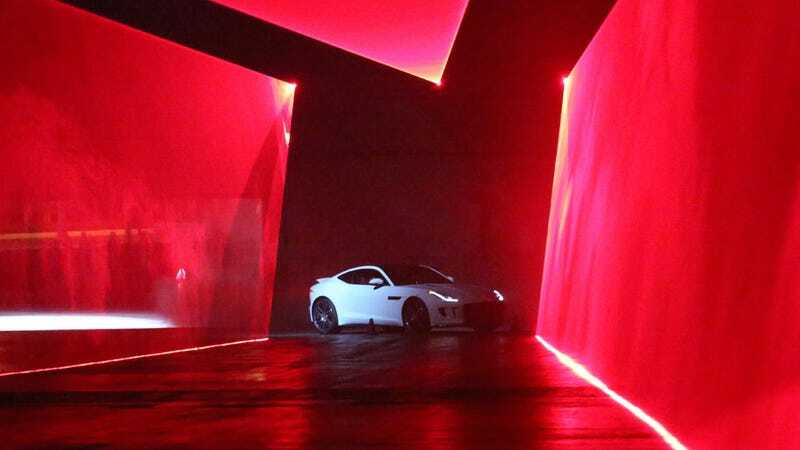 But it was exciting and fun, and that's what all this — and the very existence of cars like the F-Type — is about. I'm still waiting for the shooting brake, but this should do nicely for now.